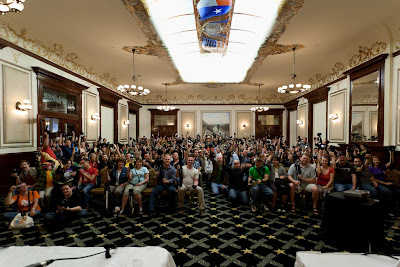 Last weekend I had the privilege of attending and assisting with Trey Ratcliff's huge SXSW Photowalk. Hundreds of photogs came out for this fun event. I volunteered to assist as a photo coach for any newbies who might have questions. All of us coaches were standing at the front as everyone got seated in the Driskill ballroom. Trey leaned over and asked if that was a wide angle lens on my camera. Yes, it was. Treys said, "Good, I need you to take the group shot." Wow! I actually got a little nervous about being the official event photographer! The room was dark, so the exposure would be tough. Of course, I had my tripod and managed to pull it off. Very cool opportunity and honor! I was proud to have my photo featured on his blog for a day. I had fun coaching others on the walk. It seemed a little weird offering advice when I haven't been a photographer all that long myself. However, I know what I know due in large part to the generous sharing of others and I'm more than happy to give back to the photog community. I expected to get lots of questions about HDR. Instead, I got asked a lot more about night exposures. I often use single long exposures at night instead of HDR. It really depends on what I'm trying to capture. In the case of light trails, I usually go with a single exposure. Here is one shot that I took while explaining what I was doing to a couple of folks. This type of shot is not very difficult. I set my ISO to 100 and my aperture to f22. I want low ISO to keep the noise down and I use f22 to get nice points on the lights. For shutter speed, I make an educated guess and take a shot. 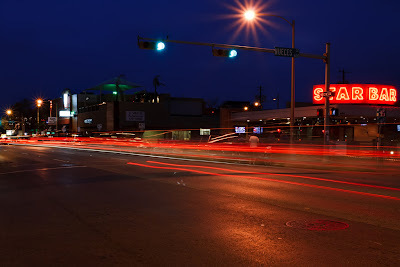 I find that 8-10 seconds is usually enough, depending on how much light there is from cars and streetlights. I try to get the car tail lights and prominent lighted signs properly exposed. Buildings may go a little dark, but I don't mind. The idea is to emphasize the light trails. 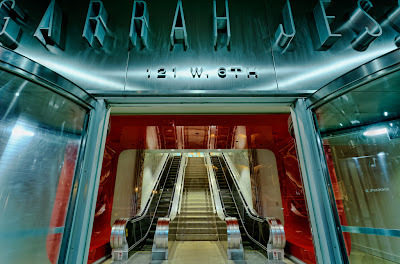 Because this was a Trey Ratcliff photo walk, I just had to get at least one HDR shot. As the walk concluded, I walked alone back to the Driskill. I passed a cool entry way to an office building. I'd seen it before and now it was time to get a shot. SXSW was in full swing, so the city streets were bustling. I moved my tripod in as tight to the building as I could to avoid being bumped by people passing by. Here is the shot that I ended up with. A few models showed up for the event as well. I had no idea that we would have models and I didn't bring any appropriate lenses for my 5D or a flash! Well, I did have my Olympus E-PL1 in my backpack with a 20mm f1.7 lens. It proved to be good enough to get a few shots of a couple of the models after the photowalk. This shot was taken at the Pure Ultra Lounge on 6th St. The lighting in this place is blue. Without a flash, the girls looked like Smurfs. So, I did a monochrome conversion and it turned out nicely. Trey was shooting for a world record number of photowalk attendees. I'm not sure if he got there, but there were certainly a great number of folks there and it was a heck of a lot of fun.